By default, X-Pack monitoring agents on Elasticsearch index data into the cluster where they’re running. In production, you should send data to a separate monitoring cluster so that historical monitoring data is available even if the nodes you are monitoring are not. Using a dedicated monitoring cluster also enables you to monitor multiple clusters from a central location. Set up the Elasticsearch cluster you want to use for monitoring, install X-Pack, and start Elasticsearch. For example, you might set up a two host cluster with the nodes es-mon-1 and es-mon-2. 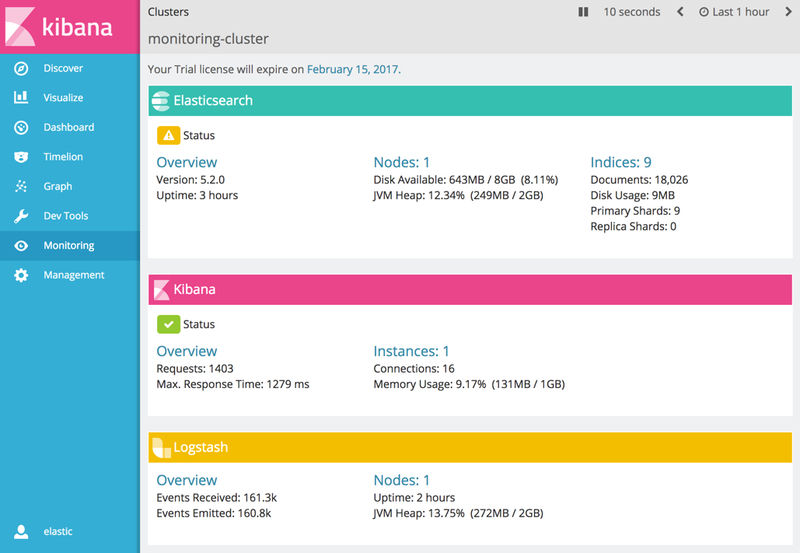 To monitor an Elasticsearch 5.x cluster, you must run Elasticsearch 5.x on the monitoring cluster. While installing X-Pack on the monitoring cluster is not absolutely required, it is strongly recommended. Configure Kibana to retrieve data from your monitoring cluster by setting the elasticsearch.url property in kibana.yml to point to the monitoring cluster. Configure the server.ssl properties to encrypt communications between the browser and the Kibana server. If SSL/TLS is enabled on the monitoring cluster, specify the trusted CA certificate(s) that will be used to verify the identity of the nodes in the monitoring cluster. For more information about configuring Kibana to connect to a secured cluster, see Kibana and Security. Install X-Pack on the Elasticsearch nodes in your production cluster. Configure each Elasticsearch node in the cluster you are monitoring to send metrics to your monitoring cluster by configuring an HTTP exporter in the xpack.monitoring.exporters settings in elasticsearch.yml. If SSL/TLS is enabled on the monitoring cluster, you must connect through HTTPS. If X-Pack security is disabled on the monitoring cluster, you can omit auth.username and auth.password. Restart Elasticsearch on the nodes in your production cluster. When you configure an exporter in elasticsearch.yml, the default local exporter is disabled. The http exporter uses the low-level Elasticsearch REST Client. This allows the http exporter to send its data to any Elasticsearch cluster it can access through the network. An http exporter defined whose arbitrary name is my_remote. host is a required setting for http exporters, which can take a few different forms. See HTTP Exporter Settings. See X-Pack monitoring TLS/SSL Settings for all TLS / SSL settings. If not supplied, the default node-level TLS / SSL settings are used.